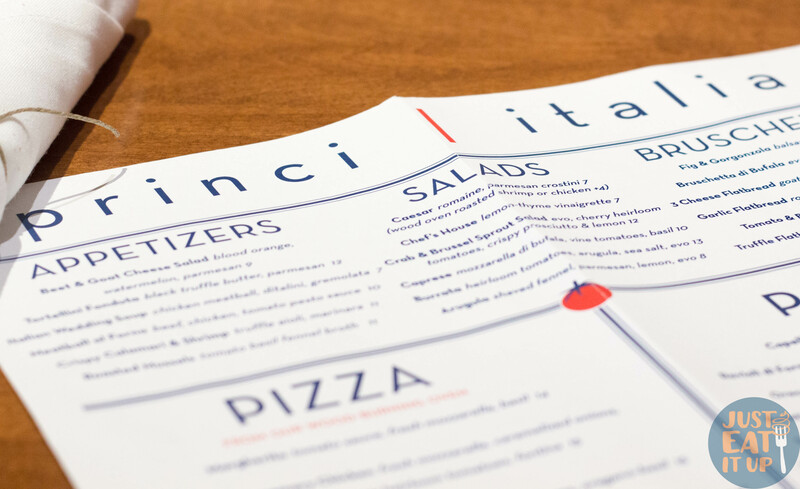 Princi Italia is the brainchild of friends Patrick Colombo and Chef Kevin Ascolese. Their vision was to open a restaurant offering the flavorful food of their Italian heritage. Well, I’m here to tell you Italy would be proud because Chef Jose Gutierrez and Chef Jungman have it going on! Garlic Flatbread: this chewy, crunchy flatbread was sprinkled with rosemary, parmesan, olive oil and sea salt. Salty, savory, fresh! Meatball al Forno: a wonderful blend of ground beef and chicken with just enough seasoning to hold their own but not overpower the wonderful acidity of the tomato sauce and nutty pesto. Tortellini Fonduta: these babies had me at fontina! Rich and heady with the irresistible melding of the butter and truffles. Caesar Salad: this one tastes as good as it looks! The crisp, fresh hearts of romaine are dressed with a housemade dressing including twelve ingredients, shaved parmesan and a couple of savory crostini. Think BIG croutons. Brilliant, because who doesn’t think the croutons are the best part of a salad? Beet & Goat Cheese Salad: this is one of my favorite salads ever! Not lying. The composed salad contains beets, blood orange, watermelon and goat cheese. The goat cheese adds a creaminess while the parmesan cheese crisp adds a little saltiness to offset the sweetness. I could eat this over and over. Spaghetti Bolognese: this is a classic Italian bolognese in the truest sense of the word. Contrary to popular belief tomatoes are not the main ingredient of a bolognese…the meat is. This sauce is thick and savory, clinging to the al dente, handmade spaghetti. Mamma mia! Saffron Fettucine: lobster, shrimp and tomatoes, oh my! Another score with perfect al dente pasta covered with a creamy saffron sauce, seafood and basil. A great addition to this dish was the arugula. Bravo Princi Italia for giving the underutilized arugula a place of honor! Roasted Rosemary Chicken Pizza: straight outta a wood-fired oven! The addition of fontina, asparagus and caramelized onions really make this pizza rise (pun intended) above the rest. Lemon Sole Carciofi: perfectly breaded and complemented with artichokes tomatoes, white wine and spinach! Chicken Piccata: tender, lightly-breaded chicken breast sauteed in a wonderful lemon-caper sauce that was good enough to drink. This dish was served with fingerling potatoes and broccolini. A great meal. S’more Cheesecake: layer upon layer of goodness! From the bottom up you’ve got graham cracker crust topped with a chocolate ganache, then marshmallow fluff cheesecake and homemade roasted marshmallows. Wait! There’s more! Yes, the cheesecake is served with a scoop of vanilla gelato. You can’t make this stuff up. Olive Oil Citrus Cake: Italian cakes are not as sweet as ours tend to be. This moist cake would be wonderful on its own. The hint of citrus is refreshing. The cake is served on a strawberry goat cheese jam then drizzled with a blueberry syrup and topped with a burnt honey gelato. Scrumptious. Assorted Cookies: perfect paired with an espresso or cappuccino. From front to back: Italian wedding cookies, cinnamon-chocolate cookies, rosemary-honey-lemon cookies and two kinds of biscotti including double-chocolate and, the Italian staple, anise. I am a firm believer in the idea that love is an action and chefs show their passion and love through their food. That being said I want to give a shout out to Chef Ryan Jungman, pastry chef at both the Plano and Dallas locations. I have been following him since I fell in love with his coconut key lime pie a couple of years ago. Chef Jungman is a DFW native and started his career in the mid-90s. He is passionate about his work and it comes through in his desserts. I love that Plano is holding its own in the local food scene. There is no doubt that Princi Italia is a big part of that scene. Until next time…just eat it up!